A century-old City Hall and Marketplace has become the new home for Springfield and Clark County’s heritage. Priceless mementos have been assembled to open an exciting window on seven generations of fascinating history. The architect of the building was Charles Creager, a native of <?xml:namespace prefix = "st1" />Springfield, who also designed buildings such as St. John's Lutheran Church, the Clark County Courthouse and the old downtown Post Office. 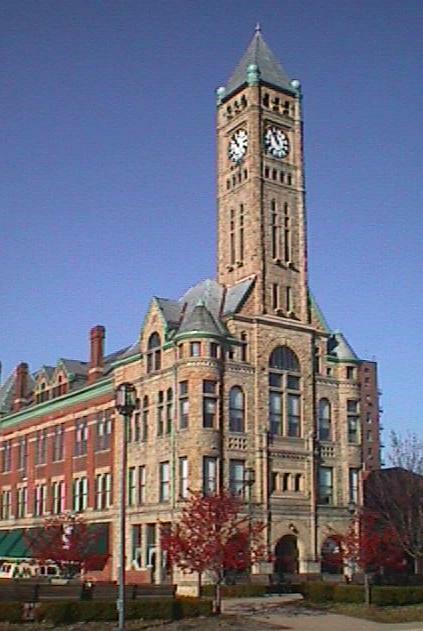 The architectural style is known as Richardsonian Romanesque. The distinguishing characteristics of this style include broad roof planes, uniform rock-faced exterior finishes, decorative flashing ridges, eaves close to the walls, short and squat chimneys, corbels, deep-set windows and large, arched entryways without columns or piers for support. Multi-purpose, educational and meeting room in the "Crabill Discovery Hall." Huenke Family Farm, located on the East end, first floor. The National Road Gallery ~ Traces the development of America’s first "interstate highway." Click HERE to see photographs of temporary exhibits and to find our more about our exhibit galleries.